7 Kids and Us: Garrett Popcorn at Home! When I used to live in Las Vegas, one of my favorite places to stop when I was out, was at a Garrett Popcorn Shop. The small of the fresh popcorn in SO many flavors was awesome! 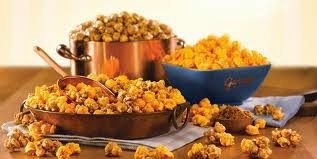 I really miss Garrett Popcorn, but I am super excited to be able to order all my favorites online. Caramel Crisp- Deep butter notes, sweet brown sugar and a crème brûlée crunch combine for a rich taste sensation. Cheese Corn- Freshly-melted, sharp cheddar cheese is stirred into each and every batch. Fans proudly display their "Cheesy-Fingers!" Pecan CaramelCrisp- Enjoy some Southern hospitality with our locally roasted pecans, lending extra flair to our beloved CaramelCrisp®. Almond CaramelCrisp- Spoil your taste buds! The addition of roasted almonds to our delicious CaramelCrisp® creates an irresistible indulgence. Macadamia CaramelCrisp- Our world famous CaramelCrisp® becomes a tantalizing, tropical treat with the introduction of exotic macadamia nuts. Buttery- Crispy. Creamy. Classic. Enjoy a handful of buttery goodness and savor the taste of pure Popcorn perfection. Plain- Our special blend of mushroom and butterfly kernels are hot air popped throughout the day. A taste so fresh, you will soon forget that we left the salt and butter behind. Cashew CaramelCrisp- Freshly roasted cashews elevate our golden CaramelCrisp® to a new level of delectable sophistication. Kettle Corn- Gently stirred in copper kettles, our freshly made KettleCorn is lightly glazed with a touch of sugar and a hint of salt. Garrett Mix- Created by our loyal fans, the Garrett Mix® combines sweet CaramelCrisp® with savory CheeseCorn. You can purchase your own tin online here.